The Salton Sea snails were discovered in 2004 in the Colorado River in California about one mile above where the river empties into the Salton Sea. 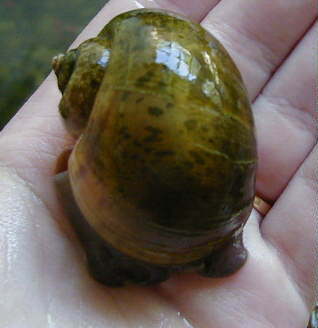 Despite the name “Salton Sea apple snails,” these snails are freshwater. The wild habitat may have some mineral content oddities due to its proximity to the Salton Sea (from salt creep) and mineral deposits above the river. These snails are probably a bottlenecked population of a canaliculata-complex species, and therefore exhibits unusual traits. It has unusual shell morphology (particularly where shell layering is concerned), and usually is quite small. Males rarely grow over 1.5″ in size, and females rarely over 2.5″. The sexual dimorphism can be quite prominent: males I have observed had a strongly convex operculum in addition to their small size. The operculum on this species may or may not harden. 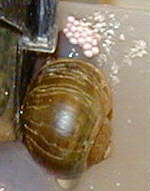 Other distinguishing traits include the location of the albumen gland in the female under the lung, where they are visible through the shell as a magenta to red mass. This places the albumen gland on the opposite side of the shell from most domestic apple snail species, the only exception being Pomacea insularum which has the albumen gland centered. Egg color ranges from pale pink to atomic red. 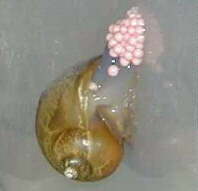 Two female “Salton Sea” apple snails laying eggs on the side of an aquarium. The average life span of this species in captivity seems to range from 6 months to 1 year. Both sexes are easily sexually mature by 2-3 months, and can reproduce at an alarming rate once mature. A long lifespan is therefore not necessary for the species to have a reproductive competitive edge. Hatchlings grow extremely fast, but the males slow down as they approach 1″ in size. Females continue to grow, possibly because being a larger female means being able to lay more eggs. Females will often grow without significantly calcifying their shell, making them susceptible to shell damage. However, their fast growth allows them to heal very fast compared to some other apple snails.